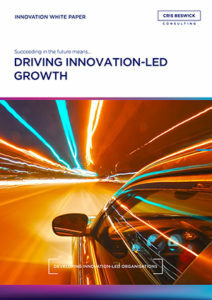 Why innovation-led growth? Quite simply because the world has moved on from the days in which a new invention, a fresh product, a slick advertising campaign or a new marketplace could deliver enough growth to keep an organisation’s customers and shareholders happy. The advent of the global-digital age has levelled the playing field to a dramatic extent. The idea that certain products or services were the sole preserve of ‘the big players’ with smaller entities left to pick up the crumbs has vanished. This levelling of playing fields is now challenging and even disrupting larger, more established organisations in ways which they would never have expected a handful of years ago. To meet these challenges, organisations now have to reinvent themselves, to meet the entrepreneurs on level terms and to match them in the flexibility and adaptability stakes in order to drive innovation-led growth.